The term ‘tsunami’ originates from Japanese and literally means harbour wave. At times it is interchangeably used with the term ‘Tidal wave’ which is considered as an error by purists. It was an unknown term till a period of time. But when we name natural disaster, it is one of the most dangerous one. Here, we will discuss about what Tsunami is, its causes, characteristics of tsunami wave, signs preceding it, most common occurring areas and also the most destructive Tsunamis in the World. A tsunami is a series of ocean waves that send surges of water on to land. In the open sea, tsunami waves are very small and almost unnoticeable. But as they near shallower waters their energy increases and they gain height of over 100 feet (30.5metres). They cause large scale destruction on the shores. Tsunamis are different from tidal waves or storm surges. The latter is caused by rise in sea levels, hurricanes and combined with tidal forces. When the ocean floor is disturbed by an underwater earthquake, a substantial amount of water above this area is displaced. The displacement then keeps moving away from the center point in all directions as waves. The wavelength of the tsunami wave is very long, often hundreds of kilometres long (a regular wave has a wavelength of about 30-40 metres). Earthquake tremors travel at 970 km /min while tsunami waves travel 800- 900 km/hour in open waters. Its speed also depends on the depth of the water. Tsunami warning centres around the globe are on constant alert monitoring underwater earthquakes strong enough to produce massive waves. Their goal is to alert vulnerable coasts, to give enough time for residents to get to higher ground. Seismologists can accurately predict when a tsunami will arrive at a given seacoast. The tsunami wave consists of a crest and a trough. When the trough reaches the shore, there is a drawback or dramatic receding of the shoreline exposing the normally submerged areas of the beach. The drawback can be hundreds of metres. The receding of the shoreline causes curiosity, while it is a warning. The greater the withdrawal, the more severe the tsunami waves will be. When the crest of the wave reaches the shore first the first sign is a high wave directly hitting the shore. Since tsunami is not a single wave but a series of them, the duration of the flooding and strong currents can be seen for hours. The seas drawback and the massive waves hit the shores nearly every 12 minutes. The force of the wave carries it at least a mile inland destroying any structure in its path. When it draws back the debris in carried in to the sea. As the main cause of tsunami is underwater earthquakes and associated phenomenon, they occur more frequently at underwater fault lines such as the Pacific Ring of Fire. This is a geologically active area where tectonic shifts cause earthquakes and volcanoes. The Pacific Tsunami Warning system is head quartered in Honolulu, Hawaii and has 26 member states since 1965. Japan is one of the countries most affected. All countries bordering the Pacific Ocean are always on tsunami alert. Another area where tectonic plates come together is in the Indian Ocean where the Australia plate contacts the Eurasia plate. The Tsunami Early warning system was set in place in November 2005 after the disastrous tsunami of 2004originated here leading to the loss of 280000 lives. In the Atlantic Ocean the occurrence of tsunamis is rarer but the islands of volcanic origin, the Canaries have the potential to trigger tsunamis. Active volcanoes lead to loss of islands, shifting of land and displacement of water. Earthquakes originating here will lead to tsunamis affecting the eastern coast of the Americas. In the Mediterranean, tsunamis occur due to earthquakes caused by the African plate drifting northwards underneath the Eurasian plate, mostly affecting Greece and southern Italy. The 9.1 magnitude earthquake off the coast of Sumatra occurred at the depth of 30 km. the sea floor was vertically displaced by several meters along a length of approx. 1300 km. the tsunami hitting Sumatra was 50 m tall and reached 5 km inland. 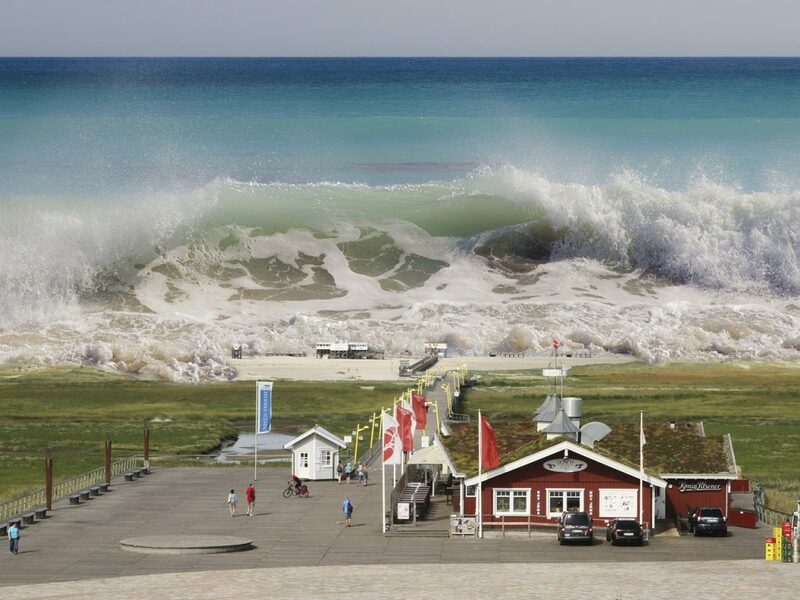 Experts estimate the energy of this tsunami was equivalent to 23000 Hiroshima bombs. The tsunami travelled up to 3000miles affecting 11 countries with loss of life estimated from 220000 to 280000. Many of these were tourists caught unaware, because of an inadequate warning system. A 9.0 magnitude earthquake, at the depth of 24.4 km, created tsunami waves 10m high, travelling at 800 km/ hour. It caused the death of more than 18000 people along the east coast of Japan. About 450000 people were relocated. The Fukushima Daiichi Nuclear power plant was damaged and turned into a nuclear emergency. The clean-up of the radioactive contamination is still going on. A magnitude 8.5 earthquake caused a series of huge wave to strike various towns along the west coast of Portugal and southern Spain, up to 30 m high in some places. 60000 were killed in Portugal, Morocco and Spain. The latter decade of the past century saw increase in the frequency of tsunami events in Indonesia (1992, 1994, 1996), Peru(1996) Japan (1993) Turkey (1999) Vanuatu(1999) Nicarauga (1992) Mexico (1995) Phillipines (1994) Papua New Guinea(1998). Though it may seem that only few tsunamis occur that are truly devastating, the truth is tsunamis occur every year. As their intensities are low they are recorded but not in the public eye. For eg. 13 western coastal towns were affected in the US by a small tsunami in October 2012, which originated from Canada. In March 2011 several US western coastal areas saw tsunami waves that originated from Japan. Though tragedies may appear unavoidable and tsunamis are natural disasters out of our control, the best way to deal with them is to be prepared.